13 Above: Worst Pandemic Wave Of H1N1 - Everything You Need To Know !! Worst Pandemic Wave Of H1N1 - Everything You Need To Know !! The H1N1 viral strain implicated in the 2009 flu pandemic among humans often is called "swine flu" because initial testing showed many of the genes in the virus were similar to influenza viruses normally occurring in North American swine.But further research has shown that the outbreak is due to a new strain of H1N1 not previously reported in pigs. Swine influenza (also called H1N1 flu, swine flu, hog flu, and pig flu) is an infection by any one of several types of swine influenza virus. 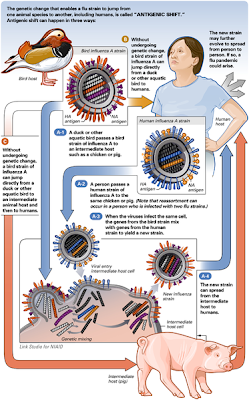 Swine influenza virus (SIV) is any strain of the influenza family of viruses that is endemic in pigs.As of 2009, the known SIV strains include influenza C and the subtypes of influenza A known as H1N1, H1N2, H3N1, H3N2, and H2N3. 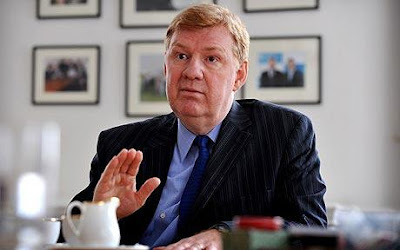 The estimated new cases of swine flu last week was just 30,000 compared to 110,000 the week before, showing that the first wave of the swine flu pandemic has now past its peak in England, Sir Liam Donaldson, the chief medical officer said. The number of deaths has increased from 27 to 36 but these have not occured in the last week, rather the invesigations into whether they are related to swine flu have now been completed. Overall two thirds of the deaths are in people with serious underlying health conditions with 12 per cent in otherwise healthy people. A fifth of the deaths occurred in young people, aged up to 15-years and almost one in three of the deaths was in the 16 to 44 year age group. Sir Liam said there had been slight shift in the pattern with the proportion in older people and those with more severe underlying conditions increasing slightly, but overall the numbers are small and this does not suggest the disease is changing in any way. The number of people in hospital with swine flu has also dropped from 746 on July 29 to 530 on August 5th. People who work with poultry and swine, especially people with intense exposures, are at increased risk of zoonotic infection with influenza virus endemic in these animals, and constitute a population of human hosts in which zoonosis and reassortment can co-occur.Vaccination of these workers against influenza and surveillance for new influenza strains among this population may therefore be an important public health measure.Transmission of influenza from swine to humans who work with swine was documented in a small surveillance study performed in 2004 at the University of Iowa.This study among others forms the basis of a recommendation that people whose jobs involve handling poultry and swine be the focus of increased public health surveillance.Other professions at particular risk of infection are veterinarians and meat processing workers, although the risk of infection for both of these groups is lower than that of farm workers. 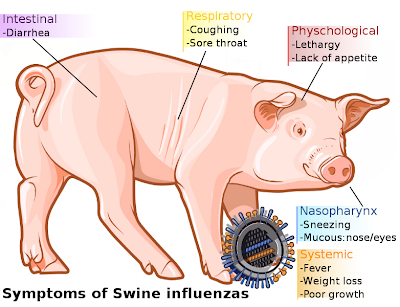 According to the Centers for Disease Control and Prevention (CDC), in humans the symptoms of the 2009 "swine flu" H1N1 virus are similar to those of influenza and of influenza-like illness in general. Symptoms include fever, cough, sore throat, body aches, headache, chills and fatigue. 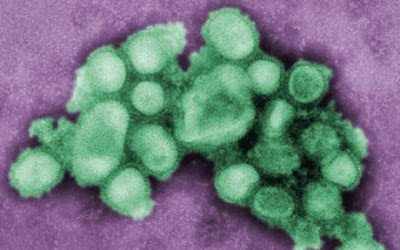 The 2009 outbreak has shown an increased percentage of patients reporting diarrhea and vomiting.The 2009 H1N1 virus is not zoonotic swine flu, as it is not transmitted from pigs to humans, but from person to person. The transmission from swine to human is believed to occur mainly in swine farms where farmers are in close contact with live pigs. Although strains of swine influenza are usually not able to infect humans this may occasionally happen, so farmers and veterinarians are encouraged to use a face mask when dealing with infected animals. The use of vaccines on swine to prevent their infection is a major method of limiting swine to human transmission. Risk factors that may contribute to swine-to-human transmission include smoking and not wearing gloves when working with sick animals. Influenza spreads between humans through coughing or sneezing and people touching something with the virus on it and then touching their own nose or mouth.Swine flu cannot be spread by pork products, since the virus is not transmitted through food.The swine flu in humans is most contagious during the first five days of the illness although some people, most commonly children, can remain contagious for up to ten days. Diagnosis can be made by sending a specimen, collected during the first five days for analysis. Recommendations to prevent spread of the virus among humans include using standard infection control against influenza. This includes frequent washing of hands with soap and water or with alcohol-based hand sanitizers, especially after being out in public.Chance of transmission is also reduced by disinfecting household surfaces, which can be done effectively with a diluted chlorine bleach solution.Although the current trivalent influenza vaccine is unlikely to provide protection against the new 2009 H1N1 strain,vaccines against the new strain are being developed and could be ready as early as June 2009. Experts agree that hand-washing can help prevent viral infections, including ordinary influenza and the swine flu virus. Influenza can spread in coughs or sneezes, but an increasing body of evidence shows small droplets containing the virus can linger on tabletops, telephones and other surfaces and be transferred via the fingers to the mouth, nose or eyes. Alcohol-based gel or foam hand sanitizers work well to destroy viruses and bacteria. Anyone with flu-like symptoms such as a sudden fever, cough or muscle aches should stay away from work or public transportation and should contact a doctor for advice. If a person becomes sick with swine flu, antiviral drugs can make the illness milder and make the patient feel better faster. They may also prevent serious flu complications. For treatment, antiviral drugs work best if started soon after getting sick (within 2 days of symptoms). Beside antivirals, supportive care at home or in hospital, focuses on controlling fevers, relieving pain and maintaining fluid balance, as well as identifying and treating any secondary infections or other medical problems. 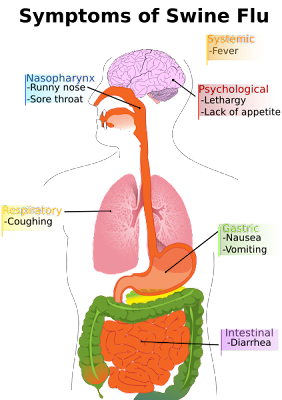 The U.S. Centers for Disease Control and Prevention recommends the use of Tamiflu (oseltamivir) or Relenza (zanamivir) for the treatment and/or prevention of infection with swine influenza viruses; however, the majority of people infected with the virus make a full recovery without requiring medical attention or antiviral drugs. The virus isolates in the 2009 outbreak have been found resistant to amantadine and rimantadine. In the U.S., on April 27, 2009, the Food and Drug Administration (FDA) issued Emergency Use Authorizations to make available Relenza and Tamiflu antiviral drugs to treat the swine influenza virus in cases for which they are currently unapproved. The agency issued these EUAs to allow treatment of patients younger than the current approval allows and to allow the widespread distribution of the drugs, including by non-licensed volunteers.